We conduct business with integrity and a sense of urgency. We help solve our customers machining challenges everyday. We utilize lean manufacturing to drive continuous improvement and operate with extreme efficiency. We share ideas and collaborate throughout the organization, with our customers and supplier partners. We succeed when our partners succeed. Be the global leader for machining, manufacturing and assembly of mission critical components. Provide our customers with superior quality and continue to advance, adapt and thrive in a global market. Create an environment where team members, our customers and our supplier partners are encouraged to innovate and are recognized and rewarded for their efforts. 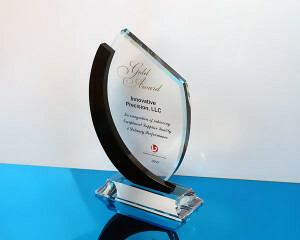 L-3 Communications presented Innovative Precision with a Gold award in recognition of achieving exceptional supplier quality and delivery performance. This award is only given to the top 2% of their supply chain. At Innovative Precision we take pride in supporting our customers with this type of high level performance. Our mission is to develop lifelong relationships and deliver complete customer satisfaction. Our custom-fit process meets even the highest standards. Fill out the form and talk to us!